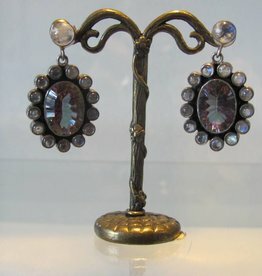 Very nice silver dormeuse earring with a pearl. Nice work on the silver setting.1,5 cm x 1 cm excluding the ear hook. 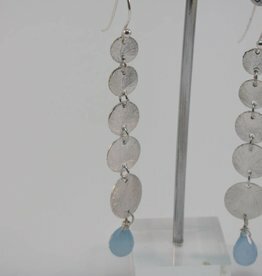 Silver earring with two cabouchon cut aventurine stones. 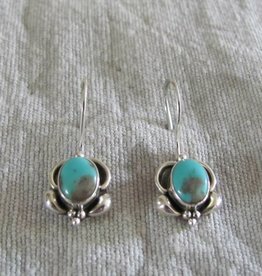 Can also be worn by childen as first pair of real earrings. They are not heavy. 1.5 cm long. 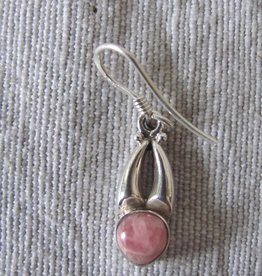 Silver earring set with a rhodocrosiet stone Made by a master craftsman in a workshop with good working conditions in India. 2,00 cm long excluding the ear hook. Fairly made. 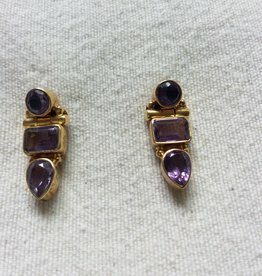 Gold on silver and amethyst earrings, 3cm long including the integrated ear hook. Dormeuse model. Open behind the stones for optimel light through the stones. Hand made in Jaipur India with good working conditions. Silver earring set with a amethyst stone. Made from by a master craftsman in a workshop with good working conditions in Jaipur India. 2,50 cm long excluding the ear hook. Fairly made. Gold on silver ear studs. Ear stud with a hand facet cut amythist. Underneath two more amythists. Hand made in a workshop with good working conditions in Jaipur India. 2.50cm long. 4.5cm long. Pretty earrings made of 925 silver and set with pearls. Hand made in Jaipur India by a master silversmith. Silver earring with a cabouchon cut malachite stone. 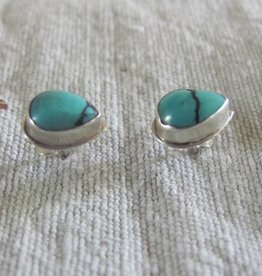 Can also be worn by childen as first pair of real earrings. They are not heavy. 1.cm long. Silver earring with two hand faceted garnet stones. Made from by a master craftsman in a workshop with good working conditions in Jaipur India. 2cm long excluding the ear hook (2cm). Fairly made. Silver earring set with a amethyst stone. Made from by a master craftsman in a workshop with good working conditions in Jaipur India. 1,50 cm long excluding the ear hook. Fairly made. Very nice silver dormeuse oorbel with a beautiful blue cabouchon labradorite stone. Nice work on the silver setting. 1,50 cm excluding the ear hook. 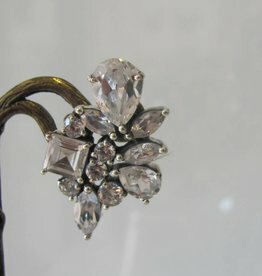 Very nice silver dormeuse oorbel met een teardrop zircon. 1,25 cm excluding the ear hook. 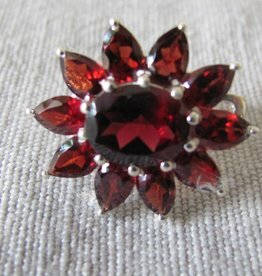 Earring dormeuse silver with garnet 2.5 x 2cm. 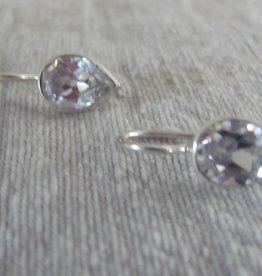 Earring rests high on the ear because the ear hook is a straight pin with an integral safety catch. Old fashion systym protects your pecious jewels from loss! Beautiful hand cut garnets.